I can’t say enough about Chico Hot Springs in Pray, Montana. (That’s about 25 miles south of Livingston and about the same distance north of the north entrance to Yellowstone National Park). Read more about Montana’s Hot Springs. Of course there are the hot pools. 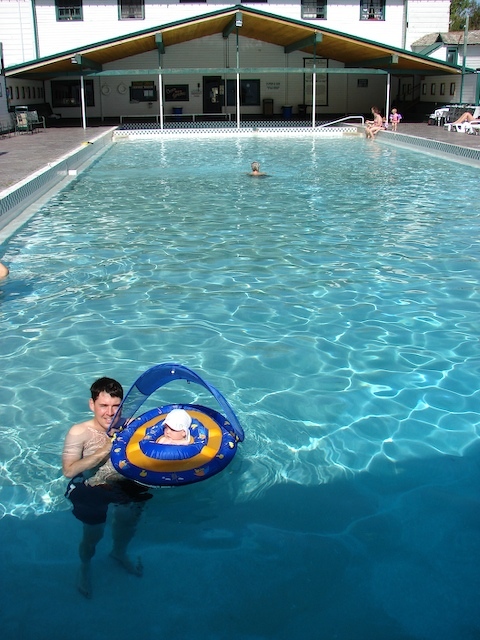 One large swimming pool that is just the right temperature for long term soaking. And a smaller, hotter pool, which I can only hang out in for a little while before passing out. We usually eat at the Grille (since the baby showed up) or at the bar (before baby), and once in a while go to the Sunday brunch at the restaurant, which serves the best brunch in the world! There is a geothermally heated greenhouse out back where they grow organic herbs, veggies and edible flowers year round. In the summer, much of the food comes from the gardens. Even in Montana you can eat locally! The food is so good at Chico Hot Springs that they’ve written a couple cookbooks to share the secrets with the rest of us. For those inclined, there is a day spa with a host of services–from massage to hot rock treatments to facials and more. And there is live music in the (now non-smoking) bar most weekend night. Lodging varies from the original hotel (bathrooms down the hall) to the Lower Lodge (pretty standard modern hotel room), to the Fishermans’ Lodge and cabins that accommodate the whole family. Chico hosts a lot of weddings and conferences, so the set-up is perfect. In the summer there is hiking nearby and horseback rides that leave from the stables right behind the hotel. Winter visitors can find great cross-country skiing in the near vicinity or take a dog-sled ride with Absaroka Dog Sled Treks. ← Ski Trails of Southwest Montana is here!